The VIA COMe-8X90 is a Type 6 COM Express basic form factor module that offers full 64-bit computing and high performance multimedia features suited for a variety of next-generation embedded applications. Available with a choice of 1.2GHz VIA Nano X2 E-Series dual core processor, the VIA COMe-8X90 also integrates the unified VIA VX900H media system processor, featuring the VIA ChromotionHD 2.0 video engine which boasts hardware acceleration of the most demanding video formats for incredibly smooth playback at resolutions up to 1080p. The VIA COMe-8X90 offers support for the latest display connectivity standards including 18/24-bit single-channel LVDS, one VGA port, one DP port and one HDMI port and also features the VIA Labs VL800 USB 3.0 host controller which offers four USB 3.0 ports. Targeted at industrial PC and large OEM customers focused on dynamic application segments, including medical, advanced gaming, industrial automation and digital signage, customers can take advantage of a proprietary start-up kit including a multi-I/O baseboard reference, or can utilize VIA's extensive technical support in developing a custom baseboard. Measuring 95mm x 125mm, COM Express is an industry standard embedded form factor developed by the PICMG (PCI Industrial Computer Manufacturers Group) to provide greater connectivity and data transfer bandwidth than the original COM (Computer-on-Module) standard. 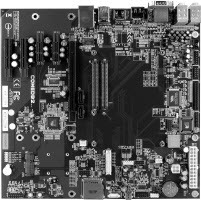 The COM Express specification integrates core CPU, chipset and memory on the module, providing support for extensive connectivity options, including USB, audio, video, and Ethernet, through board-to-board connectors to an I/O baseboard.